The whitefly Bemisia tabaci is a cosmopolitan phloem-feeding pest that causes damage in many crops due to direct feeding and vectoring plant viruses. B. tabaci is species complex of biotypes which vary greatly in their biology. The B and Q biotypes are the most dominant and damaging worldwide. B. tabaci harbors the obligatory bacterium Portiera aleyrodidarum and a diverse array of secondary symbionts (SS), including Hamiltonella, Arsenophonus, Cardinium, Wolbachia, Rickettsia and Fritschea. We initiated a study to survey the distribution and the infection status by SS of B. tabaci in Croatia. We collected several populations across the coastal part, and used molecular markers to distinguish between B and Q, and to test for the presence of SS. 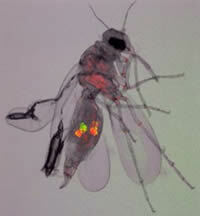 Fluorescence in situ hybridization (FISH) was used to study the localization of SS in B. tabaci. In all populations tested, only Q biotype was detected. Unlike previously described Q, the Q biotype from Croatia harbored all the secondary symbionts known from B. tabaci including Hamiltonella, however, Arsenophonus was not detected in any of the populations tested. Infection rates varied from 0 to 90%, and multiple infections were observed in many of the individuals tested. FISH analysis revealed a confined localization inside the bacteriome of all symbionts, however, Rickettsia always showed scattered phenotype. Our work initiates a comprehensive study about the status of B. tabaci in Croatia for means of better control in the future.